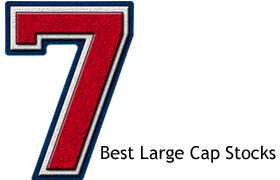 Here is the list of 7 Best Large cap stocks to buy in 2015. 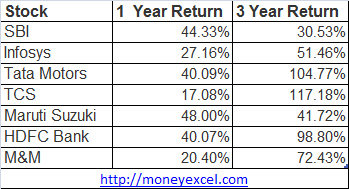 These stocks were able to deliver magnificent return in last three years. SBI is the largest public sector bank of India. According to latest report released by Kotak Securities, State Bank of India stock is expected to give 28 % annual return. The Bank has been performing consistently well. Last quarter, the company’s asset quality has improved. If interest rates will decline in the coming days, asset quality of bank will further improve. Infosys most trusted IT firm will continue to flourish in days to come. CLSA advised investors to keep Infosys in their portfolio. Target of Infosys is revised by CLSA from 2500 Rs/- to 2800 Rs/-. New Technology and digital services will surly boost the income of Infosys. Expected revenue growth of Infosys is 15%. Overweight rating on Tata Motors has retained by Barclays. Target of Tata Motors is ir revised to 729 Rs/-. In coming financial year volume growth of Jaguar Land Rover is expected to grow. It is recommended to keep this stock in portfolio. Brokerage house Prabudas Liladhar is positive on TCS. Report dated 5th March published by them said that TCS is expected to give 22% return. Target price of TCS is set as 3100 Rs/-. Report further clarifies that economic change in Europe and America will positively impact TCS. In auto sector Maruti Suzuki is first choice of CLSA. CLSA advise to purchase Maruti with target price of Rs 4,400. New products and growth in export volume will increase revenue of company. Maruti is expected to give 21% return in 2015. According to report released by MK, HDFC Bank is expected to give 19% return in 2015. Target price of HDFC bank is 1205 Rs/. Improved economical condition and decline in interest rates will improve asset quality of bank. Brokerage house Prabhudas Liladhar has set 10% return target for M&M in 2015. Target price of Mahindra & Mahindra is 1310 Rs/-. Positive outlook is set for all business of Mahindra & Mahindra. Do you recommend investment in above stocks? Do you think above stock will give good return in 2015-16?